This Porsche Carrera 911 customer wanted us to fit factory parking sensors and retrofit the latest wireless Apple CarPlay. 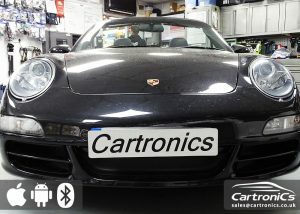 This customer wanted to upgrade their Porsche Carrera 4S (991/911) with a new entertainment system that allowed them to connect their iPhone and stream media via bluetooth. We can repair Porsche amplifiers so you don’t have to buy an expensive replacement. This customer wanted to upgrade their Porsche radio navigation system to the latest Pioneer touchscreen which allows for both Apple CarPlay and Android Auto. We installed a mObridge M2 Connect in this customer’s Porsche 911 GT (997) to allow him to play his iPhone and USB via his Porsche CDR24.